Save $1 on Fresh to Market Olive Oil and Passport Balsamic Vinegar. We love tomatoes for the delicious taste of summer they bring to the table, but who knew they could also help us achieve supple, smooth skin? 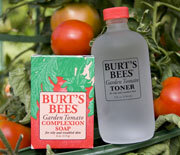 Burt’s Bees Garden Tomato Toner and Soap use tomato extract to naturally cleanse and balance troubled facial skin. As an added bonus, cucumber and parsley extracts help clean and tighten pores, leaving skin refined and firm. Check out our weekly ad (3.2 MB PDF) to find even more great savings this week! El Dorado Hills: Try wines from around the world from Terlato Wine Co.
Nugget Markets is again a major sponsor of the Davis Farm to School Connection’s Village Feast event at Davis Central Park. All proceeds from the event go to the Davis Farm to School Connection, which provides support in Davis schools for garden-based learning, recycling and improved school lunches. Please visit davisfarmtoschool.org to find out more and to purchase Village Feast tickets online. Prices valid 8/18/2010 - 8/24/2010. 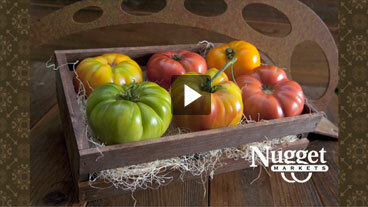 Take a trip with Nugget Markets to Capay Organics, where you’ll learn about the farm, the family, and the history behind your favorite Capay heirloom tomatoes. A delicious twist on the classic Caprese: The avocado adds a creamy counterpoint to the acid in the tomatoes, while the Casero cheese contributes a salty tang. For even more of a twist on the classic, try this modern Caprese and savor the contrast between the juicy tomatoes, soft cheese, and crisp cucumber. If you’re like me, you live for these summer months when tomatoes are at their finest — vine-ripe and bursting with flavor. From fanciful heirloom varieties with their colorfully wrinkled skins, to the basic beefsteak, tomatoes are nutritional wonders with many uses. A tennis-ball-sized tomato provides 60 percent of your daily value for vitamin C and a wealth of lycopene, two antioxidants that studies show not only help lower cancer risk but also may help slow the signs of aging. 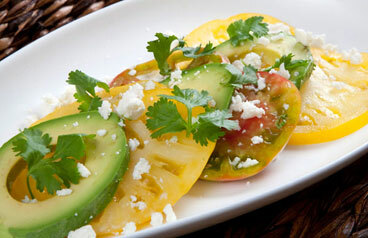 Tomatoes have also been shown to help lower the risk of heart disease. Each serving supplies 15 percent of your daily value of potassium, a mineral that helps regulate healthy blood pressure, along with 15 percent of your daily fiber needs. Researchers note that these two nutrients may work in synergy with the lycopene to boost heart health. 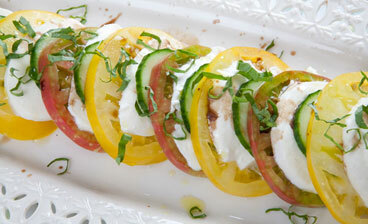 Add sliced, chopped or chunked tomatoes into salads, omelets, sandwiches and wraps. Combine chopped tomatoes with diced onion, cilantro and peppers for a vibrant salsa. Sauté garlic, olives, tomatoes and capers and toss with cooked pasta for a taste of Italy. Serve tomatoes diced and combined with garlic and olive oil over toasted bread or with slices of fresh mozzarella cheese and basil for luscious appetizers.